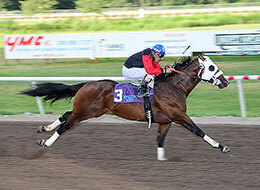 James First Affair, under jockey Eddie Aceves, easily winning the Bitterroot Derby Saturday night at Les Bois Park. BOISE, ID�JUNE 20, 2015�James First Affair drifted out slightly under jockey Eddie Aceves as he posted an easy 1� length victory over Rtm Mr Caccia in the $41,787 Bitterroot Derby Saturday night at Les Bois Park. Movin Assets finished a nose back in third. Owned by Robin Dunn, Larry Chapple and RTM Stables, LLC, James First Affair completed the 400 yard task in :19.608 seconds to earn a 97 speed index. The $16,717 winner's purse boosted his career total to $67,352. James Hanson saddled the IVORY JAMES Oklahoma-bred out of Fancys First Affair by First Down Dash. Bred by Tom Bradbury and Kim Kessinger, James First Affair has won five of 11 career starts. Second in the John Deere Juvenile Challenge at Les Bois Park last year, the brown colt was also a finalist in the Grade 1 Los Alamitos Winter Derby in February. James Hanson also saddled runner-up Rtm Mr Caccia for owner RTM Stables, LLC. Susan Hanson bred the NO SECRETS HERE gelding in Idaho. Ridden by Nakia Ramirez, Rtm Mr Caccia picked up $8,358 for the effort. The multiple stakes-placed gray is out of Shirleys Secret, by Dashin Is Easy. Movin Assets earned $4,179 for her third place effort for owners Kent and Brenda Hoover. Bill Hoburg trains the filly bred by in Washing State by Brenda Hoover. Completing the Bitterroot Derby field were Getoutofthefasatlane, Uintas Legendary, Sh Im A Fighter, Makin Snow, Brain Freeze, Teller Im Nuts and Dk The Nacho Lady.